A Sydney girl, Fiona, 34, grew up by the sea and the bush and a natural love of everything wild. Fiona has worked as a property consultant for 8 years, and always weaved in volunteering with animals throughout this time. She spent six months volunteering in Africa and America in wildlife rehabilitation, volunteered in three zoos (London, Beijing and Taronga) and is now head of the youth committee for the Foundation for the National Parks and Wildlife in New South Wales. Founder of Excellence in World Zoos, she was able to combine her love of animals with her two degrees of Economics and Property. Her organisation instigates redevelopment of poor enclosures in developing countries. Her first project was the Australian Zone of the Beijing Zoo in time for the Olympics. Fiona left her property job in 2008 and went as a full-­‐time volunteer with Sea Shepherd for two and a half years ..she says “ I was living my ultimate dream by being able to work full time representing animals and their rights around the world.” Fiona initially volunteered in the head office of Sea Shepherd for six weeks on an island off Seattle and then got invited on the ships. She did two arduous campaigns down to Antarctica on the Bob Barker ship stopping the Japanese whalers, one campaign in the Faroe Islands stopping the killing of pilot whales and was Sea Shepherd campaign co coordinator for the Gulf of Mexico Oil spill. Fiona was Sea Shepherd spokeswoman in the USA for two summer seasons – talking about her experiences in Antarctica and promoting the show Whale Wars – the reality TV show that documents their journey. Fiona was on 26 radio shows and 5 TV interviews – including a one-­‐hour show with Larry King Live! with the Captain Paul Watson. 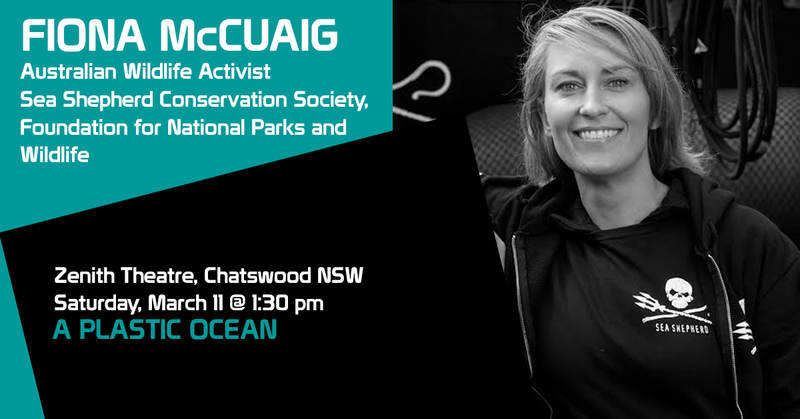 Back in Sydney now, she is educating schools and orgnaisations about the health of the ocean and was a speaker at Climate Action Summit in June 2012. With a human population predicted to double to 12 billion, Fiona believes there is a huge amount of work to be done in her life to prevent the extinction of many species of wildlife.